Narrating Life: Somebody Should Have Warned Me. Somebody Should Have Warned Me. We decided to pair up for the cooking assignments and have one person bring the dippings and the other person bring the dippers (that sounded better in my head). I will be bringing some Idaho meat for the broth/oil fondue and bread for the cheese fondue. Of course I made the famous No Kead Bread (I know Nate and Lorne...we don't "knead" it...hahahaha ha) and this time I decided to follow Michelle's* recommendation (she's Charlotte's niece so I pretty much believe anything she has to say about cooking) and added a little rosemary and lemon zest. It already smells amazing just sitting on my counter. By the way, you all read Smitten Kitchen right? If you start, there's no turning back. Also, you might feel a little bit guilty for ever complaining about not having enough space in your kitchen, because she cooks in a 42 square foot space. You feel guilty now don't you? It's okay, you'll get over it. You get to roll the dough out like a snake which I'm pretty much awesome at since it's the only thing I do with PlayDoh. 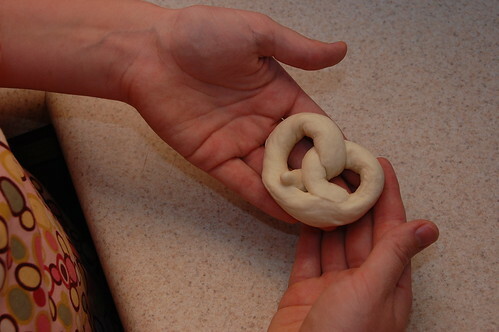 I kept remembering some Mr. Rogers episode, or maybe just my mother explaining to me that the twist in a pretzel represents a child's arms in prayer? I don't know...yall can google it. Thanks for taking the pictures N8tr0n! 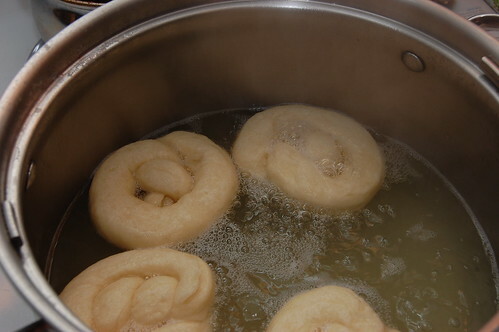 Boiling the pretzels before they go in the oven. SK says "poaching"
I skipped pictures of "coat with egg wash and sprinkle with salt." I nabbed this one before heading off to babysit my friend April's adorable brood. Two minutes down the road as I was sinking my teeth into this baby I had to call N8tr0n to say "holycraptheseareawesome!" I'm fairly certain I will make these many times during my lifetime. I can't wait until Z is older and she can make them with me. This would be such a fun things for kids to make. If you decide to make some yourself, save some for me! *By the way, Michelle has a recipe for marinara that is de-freakin-licious. It has become a staple for me. Shut up. Where did you get that awesome apron!? I can't wait to try these. I know they'll make my pants fit better. Cute apron! I've used that fabric before. And now I want to make an apron. I love getting linked on your blog! So glad you are enjoying the recipes. A cooking club sounds fun, and man do I ever love fondue. 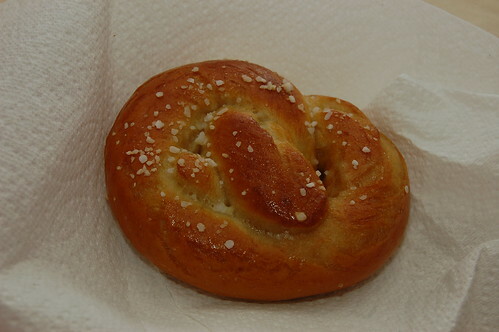 And homemade pretzels. Fabulous apron and pretzels are my favorite! Your's look delightful!